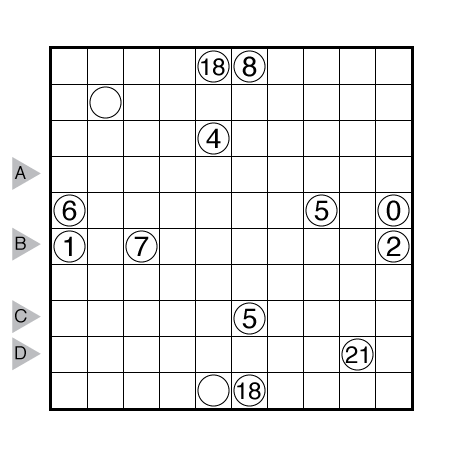 Author/Opus: This is the 111th puzzle from our contributing puzzlemaster Prasanna Seshadri. Rules: Standard Kurotto rules. 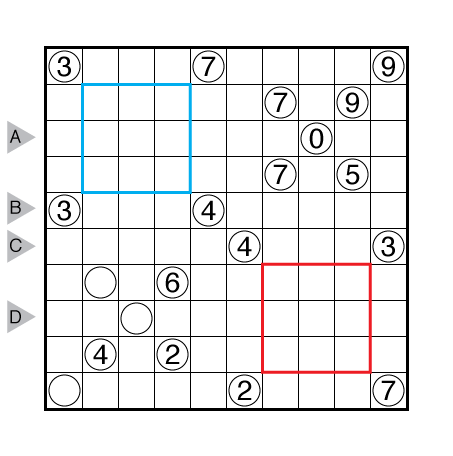 Also there are two windows in the upper left (blue) and lower right (red) of the grid. The cells in the same position in these windows must have the exact opposite shading. 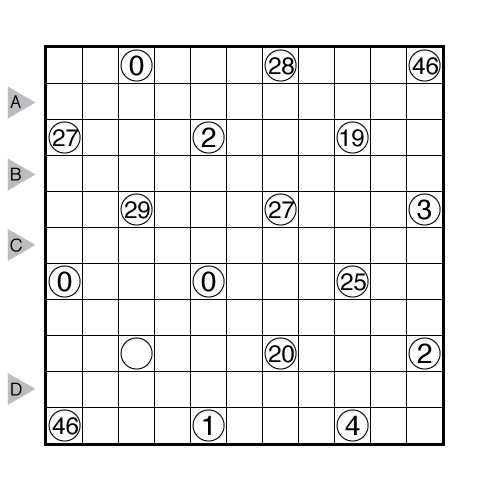 Author/Opus: This is the 100th puzzle from our contributing puzzlemaster Prasanna Seshadri. Rules: This puzzle combines styles that involve shading cells. 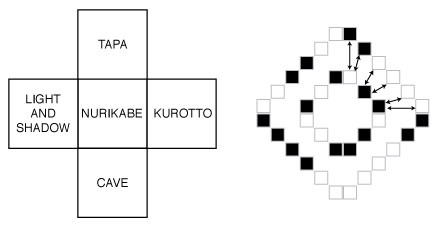 All rules are standard for the given puzzle types (Tapa, Light and Shadow, Nurikabe, Kurotto, and Cave) which appear in the indicated spots of the grid (see below). Tapa: Shade some empty cells black to create a single connected wall. Numbers in a cell indicate the length of consecutive shaded blocks in the neighboring cells. If there is more than one number in a cell, then there must be at least one white (unshaded) cell between the black cell groups. 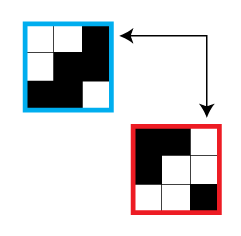 Cells with numbers cannot be shaded, and the shaded cells cannot form a 2×2 square anywhere in the grid. Light and Shadow: Divide the grid into shaded and unshaded regions, each containing exactly one number and with an area equal to that number. Numbers in white cells are part of white regions; numbers in shaded cells are part of shaded regions. Same colored regions cannot share an edge. Nurikabe: Shade some empty cells black so that the grid is divided into white areas, each containing exactly one number and with the same area in cells as that number. Two white areas may only touch diagonally. All black cells must be connected with each other, but no 2×2 group of cells can be entirely shaded black. 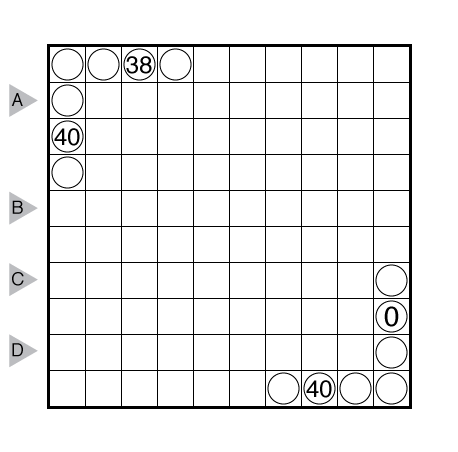 Kurotto: Shade some cells so that each circled number represents the total count of shaded cells in connected groups sharing an edge with that number. Cells with circles cannot be shaded. Cave: (The inside of the cave with the numbered cells is shaded here!) Shade some cells to form a single connected group — the cave — with no enclosed, unshaded cells. In other words, all unshaded cells must be connected by other unshaded cells to an edge of the grid. All numbered cells must be a part of the cave, with each number indicating the total count of cells connected vertically and horizontally to the numbered cell including the cell itself. Additionally, there are two diamonds made out of cells in each grid. Each cell in the smaller diamond corresponds to two cells in the same position in the larger diamond (see example below). The corresponding cells must differ in their shading (i.e., if a cell in the smaller diamond is shaded, both corresponding cells in the larger diamond are unshaded; if a cell in the smaller diamond is unshaded, both corresponding cells in the larger diamond are shaded). 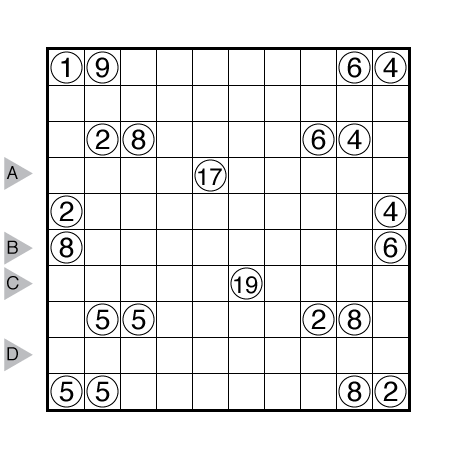 Author/Opus: This is the 78th puzzle from our contributing puzzlemaster Prasanna Seshadri. 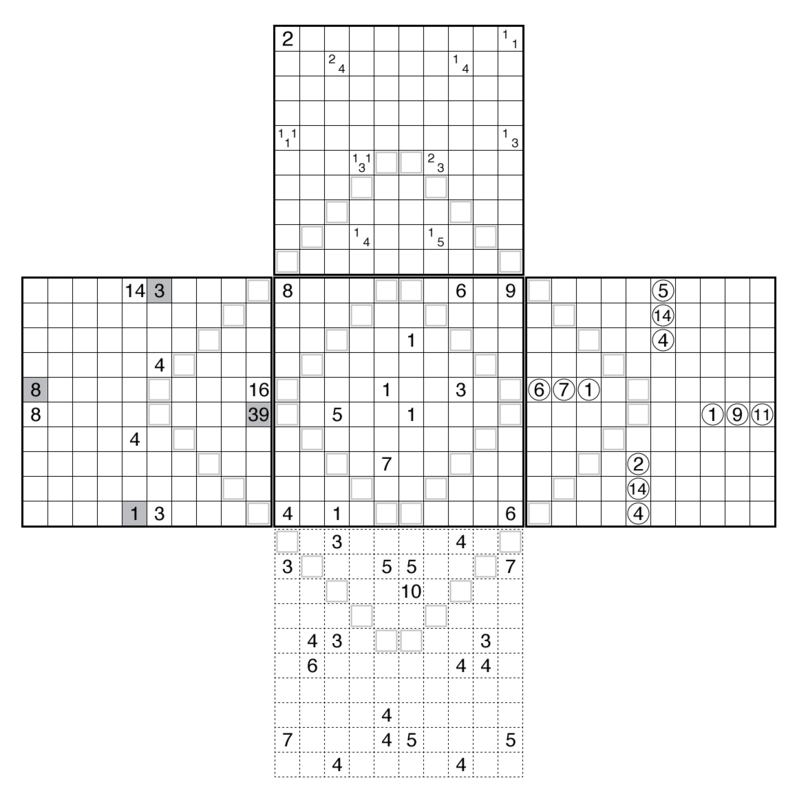 Author/Opus: This is the 48th puzzle from our contributing puzzlemaster Prasanna Seshadri. Author/Opus: This is the 47th puzzle from our contributing puzzlemaster Prasanna Seshadri. 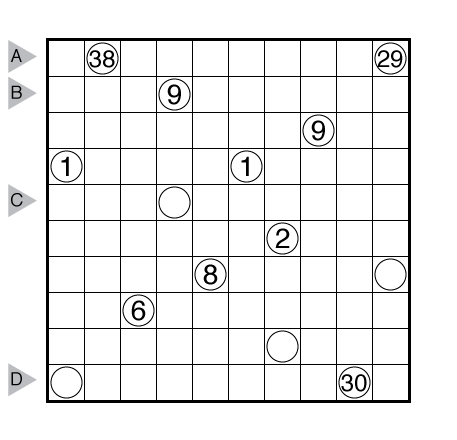 Author/Opus: This is the 36th puzzle from our contributing puzzlemaster Prasanna Seshadri.